Hours before the NFL season was set to kick off in full on Sunday, President Trump took a dig at the league’s declining viewership for its primetime opener last Thursday, when the Philadelphia Eagles took on the Atlanta Falcons. Calling the viewership “the lowest in a decade,” Trump suggested that if players stood for “The Star-Spangled Banner” then the ratings would improve. According to NBC, which broadcast the game between the Eagles and Falcons, the primetime opener drew a 13.4 overnight rating, down 8 percent from last year’s NFL kickoff game between the Kansas City Chiefs and New England Patriots. While a number of factors conspired to impact the viewership – a mediocre first half and a thunderstorm that delayed the start by an hour – Sports Media Watch noted that the game was still the lowest overnight rating for a season opener in 10 years, when the 2008 kickoff game was moved up so it ended prior to Sen. John McCain’s acceptance speech at the Republican National Convention. The low ratings provided more fodder for Trump’s ongoing battle with the NFL over certain players kneeling or refusing to stand during the national anthem. 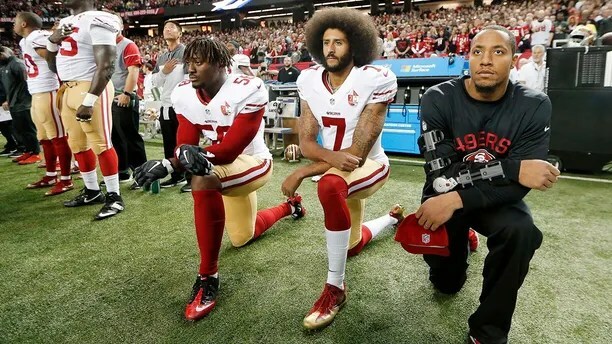 While players have asserted that the protest — which started two seasons ago when former San Francisco 49ers Quarterback Colin Kaepernick took a knee — is about bringing attention to racial inequality, police brutality and other issues, Trump has called it disrespectful to the Armed Forces and continually correlated the protests with the NFL’s declining viewership. Among the prized 18-45 demographic, Nilesen reported that the NFL’s viewership did decline 12 percent in the 2017 season. But this decline mirrors a trend across all broadcast television, which in total dipped 16 percent in 2017 thanks in large part to the rise in popularity of streaming services such as Netflix and Hulu. Along with the ratings, Trump also slammed the NFL for running a controversial Nike commercial featuring Kaepernick. The commercial, which was released last Wednesday, highlights superstar athletes LeBron James, Serena Williams and others, and touches on the controversy of NFL players protesting. Kaepernick recently renegotiated a multiyear agreement with the athletic brand to make him one of the faces of Nike’s 30th anniversary “Just Do It” campaign, according to a person familiar with the situation who spoke on condition of anonymity because details of the deal had not been revealed publicly. The endorsement deal between Nike and Kaepernick prompted a flood of debate earlier in the week. It was a trending topic on Twitter and other social networks, with some fans urging a boycott of the company’s clothes and sneakers — even burning and cutting out the signature swoosh logos on their gear. Trump on Wednesday tweeted that Nike is getting “killed” over the endorsement deal.